Posted on: February 12, 2016 By: Christopher Brown, Esq. In the great non-blizzard of 1989, two young brothers found their sledding attempts to be failing due to a lack of snow. Evening news forecasters raised their hopes day after day, only to keep finding brittle yellow-green grass still covering the front yard in the morning. So, they took matters into their own hands. They retrieved the yellow sledding saucer from the porch and they peered down the basement stairs. Mom was in the kitchen and Dad was in the basement with colleagues. “You first,” the older brother said. He hesitated. “I’ll be right after you,” he reassured his younger sibling. The younger brother steadied himself on saucer and… thunk-thunk-thunk… THUD. He forgot to turn right at the landing, ran into a wall, and had the lump on his forehead to prove it. It is easy to prove fault in this case. The younger brother filed an accident claim with their parents and the older brother was summarily grounded. But what about in the wider world? Plenty of injuries occur on stairs both by accident and as a result of preventable circumstances – and proving fault may not be as clear as the childhood sledding incident! Here is helpful information for you to determine how to prove fault in accidents occurring on stairs. Accidents occurring on stairs are generally preventable. Stairs located in or outside of commercial buildings, private residences (including both owned and rental properties), and other public spaces (such as recreation facilities, parks, public transportation, sidewalks, etc.) should all be reasonably maintained in order to prevent user injury. Stairs may be dangerous both by commission and by omission, that is, because the property owners intentionally or unintentionally maintained low standards of care. For example, stairs might be dangerous due to poor construction (building code violations), lack of maintenance, or because the stairs have too many obstacles (clutter) to be used safely. Code violations may also include lack of a safe railing structure to grasp or lean on while walking up or down the stairs, uneven stair height and depth, or use of poor construction materials (check your state of residence for further information on building codes). Furthermore, there may also be inclement weather-related dangers, including stairs that have not been physically or chemically cleared of ice and snow. Property owners and managers who have stairs that have not been reasonably maintained for everyday use may be liable to legal action by those who slip or fall. For more information, review our informational section on Virginia premises liability. Both public and private property owners and managers must be vigilant about the safety of their staircases. For example, a staircase should be regularly checked for worn, frayed, torn, or uneven surfaces in all circumstances and do everything possible to quickly respond to any problems that might arise. When liquid spills, chemical conditions (such as a recent application of floor polish), or inclement weather occurs causing slippery conditions on stairs, every reasonable effort should be made to remove the possibility of unsafe conditions from stair treads. Staircase liability assumes that owners and managers will do everything possible to build and maintain indoor and outdoor staircases with reasonable levels of safety for regular use. If you were to slip and fall on stairs, you would need to demonstrate that property owners or managers intentionally or unintentionally did not make reasonable efforts to maintain safe conditions on their staircases. Proving negligence or fault requires assistance from a legal professional. There would be no questions if you or your brother took a sled ride down the stairs! However, slip and fall accidents on stairs occur most often in everyday use. If you are in an accident and wish to file a claim, you’ll want to consider where you were going and how you were using the stairs prior to and during the accident. Was there a long-standing liquid spill present? Had water, snow, or ice built up on the treads? Did you have a handrail available that was easy to grasp, safe to use, and built according to regional codes? Did you or could you have notified someone of the problem before using the stairs? Establishing your role in in the accident when filing a slip and fall accident claim is called comparative negligence. Stairs are a normal part of everyday life, encountered in most public and private spaces. You will use them and chances are those who own the property you’re visiting will choose to maintain them. However, in the unfortunate case of a slip or fall on stairs, make sure you can provide a detailed account of what happened. Be able to describe the location, the circumstances, the involvement (or lack thereof) of the property owner or manager, and your involvement in the accident. The ability to fully and accurately tell the story of how you were injured is imperative when proving fault in any stair-related accident. 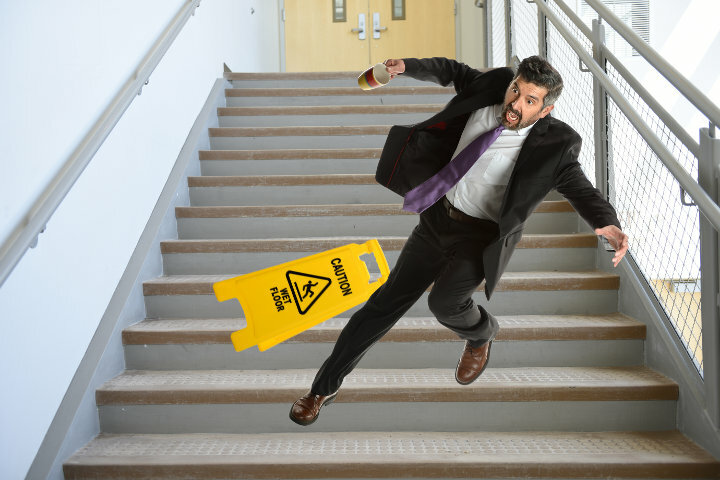 Contact a Fairfax Slip and Fall Attorney Today! If you have been injured in a stair-related accident, you may be able to seek damages that will support your medical treatment and rehabilitation bills. Furthermore, you might help others who would use the same stairways and become injured as you were. Help yourself and help hold public and private property owners to the highest standards of care for their stairs. If you have slipped or fallen in a stair-related accident, please contact The Brown Firm PLLC for a free consultation. The highest quality personal injury lawyers can help you investigate the circumstances of your accident, make a claim, and receive the compensation you need for a full recovery.